This module is intended for advanced undergraduates in business and management, accounting, finance, or economics, and Master students. The module is delivered over a total of 24 hours of lectures with a flexible format including traditional lectures, class discussions of the end-of-chapter questions in Goergen (2018) and the multiple choice questions (see below). This module aims to introduce you to recent developments in the theory and practice of corporate governance. 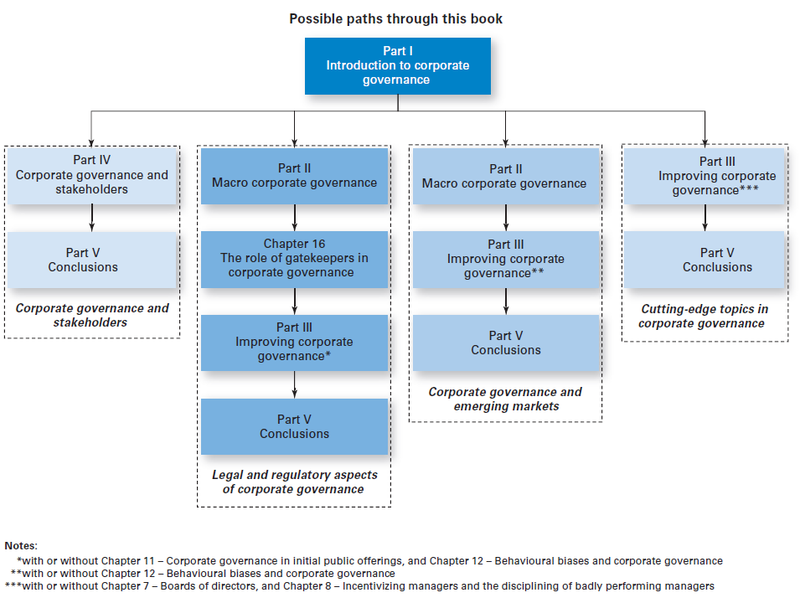 The module adopts an international perspective by comparing the main corporate governance systems across the world. On completion of the module you should be able to: Evaluate the current state of corporate governance in an international context; describe differences in corporate control and managerial power across the world; assess the potential conflicts of interests that may arise in various corporate governance environments; critically evaluate the effectiveness of the main corporate governance mechanisms and their impact on firm value; explain the potential consequences of weak corporate governance as well as behavioural biases on corporate decision making and firm value; analyse the development of corporate social responsibility. Goergen, M. (2018), Corporate Governance. A Global Perspective. Andover: Cengage EMA, ISBN 978-1-473-75917-6. The above module outline is just one of the many paths through Goergen (2018). There are others, some of which are depicted in the diagram below.